This weekend marked the opening of Jim Hodges: Give More Than You Take, an exhibition of 25 years of work by sculptor/installation artist Jim Hodges. Made using flowers and scarves, chains and denim, his pieces transform everyday objects into quietly emotive reflections on life and love. As a part of the celebration of Hodges’ art, musical group Sisyphus was commissioned to create work inspired by Hodges. And inspired they were: their self-titled LP — with a cover featuring a piece by Hodges — will be released on March 18. On Saturday, all voices in the project were brought together for an opening day dialogue. In her introduction, Olga Viso, the Walker’s Executive Director and exhibition co-curator, provided a helpful identification of the many parties involved: artist Jim Hodges, the musicians of Sisyphus (Sufjan Stevens, Son Lux, and Serengeti), their co-commissioners (the Walker and the SPCO’s Liquid Music series), and the host that afternoon, Bill Arning of Contemporary Arts Museum Houston. In his introduction of the artist, Arning recalled a quote of Hodges’ that framed the Sisyphus collaboration and their discussion that afternoon: “Art without music makes no sense.” Later, Hodges elaborated on this idea and the universality of music. “Music is the primary art source,” he explained, “the connectedness that runs through everyone.” It also serves as a personal inspiration for Hodges. 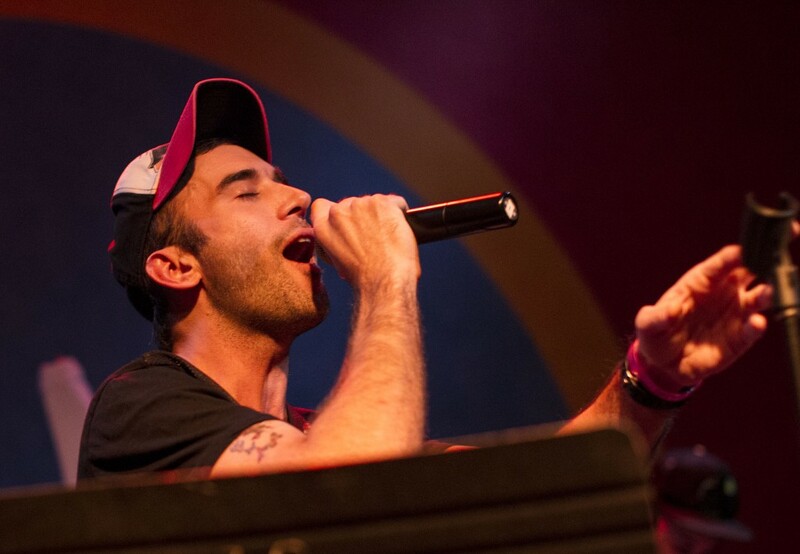 Single artists or tracks (including some by Sufjan Stevens) become a through line in his process, their sound providing continuity within the studio as he works on a piece. This collaboration turned this order of inspiration around. Arning asserted that “visual art is a catalyst,” sparking a dialogue by asking questions: “Do you see what I see? Do you get what I get from it?” As the members of Sisyphus meditated on Hodges’ work, this dialogue took a musical form through the melding of their distinct voices. With the creation of this album, these artists’ exchange on Hodges work is made permanent, the album a sonic manifestation of a shared reaction to a set of visual art. It took a few steps for Sisyphus’ work with Hodges to fall into place; Stevens admitted he didn’t remember exactly how it happened. The Walker approached Hodges about collaborating with a musician, Hodges recommended Stevens, and a friend of his suggested he work on this project with Son Lux and Serengeti. (The three had previously released music as s/s/s). Eventually, Sisyphus found themselves in Hodges’ studio, admiring past and current work. That day, perhaps an auspicious omen, all four men were wearing camouflage, a common motif in Hodges’ pieces. During the dialogue, the musicians of Sisyphus recalled what they found so compelling about Hodges’ work. Stevens was inspired by a “unique earnestness” and an “absence of irony,” qualities rare in life and art today. Sisyphus set out to emulate this emotional purity in their own work. Ryan Lott (Son Lux) believes that Hodges’ art looks inward without reservations or judgments. By being openly introspective, we also open ourselves up to others, the personal investigation also serving the interpersonal. These artists are from different generations and work in different media, so this sense of hope takes on very different forms. Hodges’ balance of growth and decay, natural and urban is soft and reflective – a favorite piece of mine consists of a set of flower sketches on napkins. Sisyphus, however, is anything but understated. 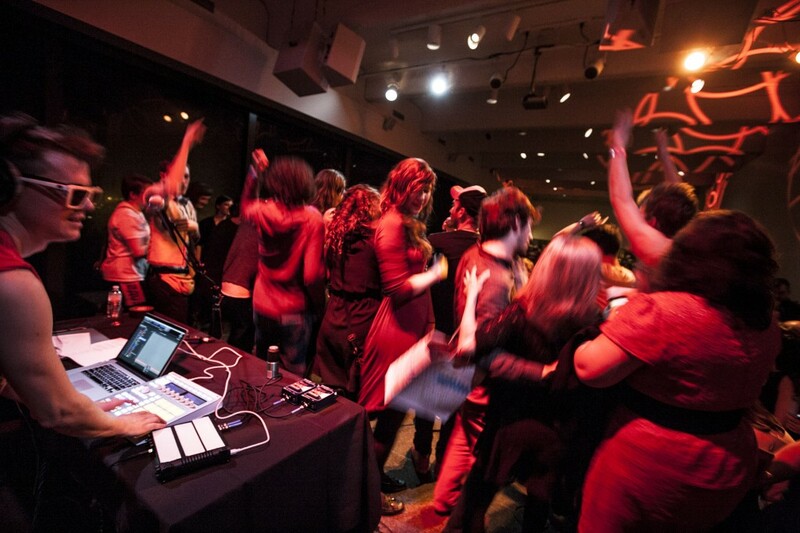 During their performance as a part of the Walker’s After Hours party, their in-your-face beats dominated the Garden Terrace Room as they invited partygoers to join them onstage. As they sang “Calm It Down,” fists pumped and hips swung as a physical remedy to the mental distress the song describes. Similarly at odds with the tranquility in Hodges work is Sisyphus’ video “Alcohol,” which opened the dialogue. The video was presented without context, and I’ll admit that I was a little put off when it began. The rapid fire, pixelated pop culture felt uninspired after viewing Hodges’ work. By the end, however, I became wholly engrossed, especially in the juxtaposition of images of life and death that became less subtle as the video went on. While dealing with the same subjects as Hodges, Sisyphus is explicit and brazen in their treatment. In an interview with Olga Viso, Hodges explained that there is a “problem with interpretation and translation from one form to another, when in fact the form of the original is set and specific. Translating it changes it and can leave it behind.” In Sisyphus’ interpretation and translation of his work, changes certainly do arise as the volume is turned way, way up. But their shared message ensures that Hodges’ intent is not left completely behind.